Recently WHO caused a big stir by announcing that processed meat was carcinogenic, and that red meat “might be.” Here we take a look at the China Study data. (Not the book (aka the vegan bible), but the raw data itself. By red meat, WHO means mammal meat. Processed meat could be carcinogenic. It depends on how it was processed. Non-processed meat that was raised in unsanitary conditions is not healthy either. Finally, consuming huge quantities of red meat (or anything else) is not healthy.If anyone has an agenda whose objective is to reduce meat consumption, it is not at all difficult to come up with something negative. One has merely to mix healthy meat with any or all of the above. Or lump trans-fat in with red meat. Or fail to control for overindulgence. This is the trouble with statistics. By selecting the subgroup you look at, and deciding which confounding variables to apply, almost any result can be obtained. 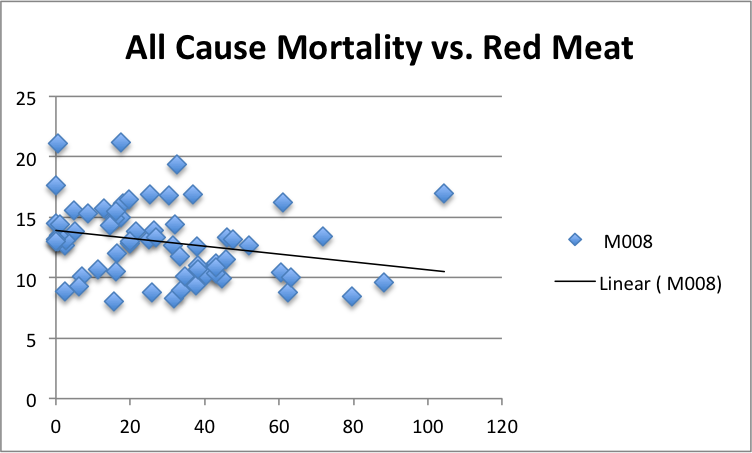 Does eating red meat cause an increase or decrease in all-cause mortality? 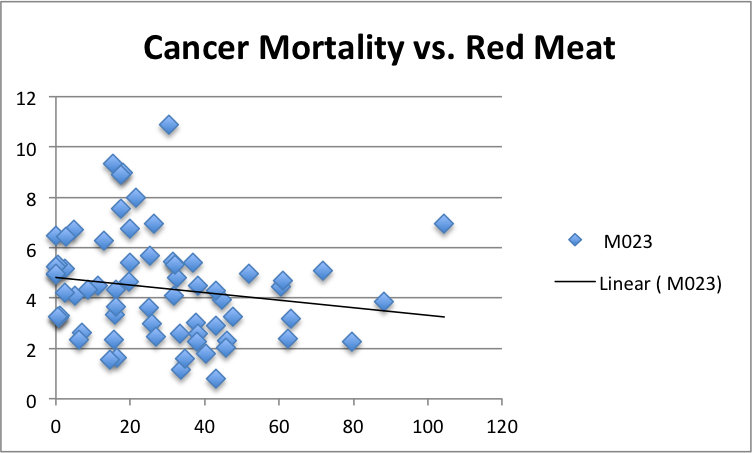 Does eating red meat cause an increase or decrease in all-cancer mortality? 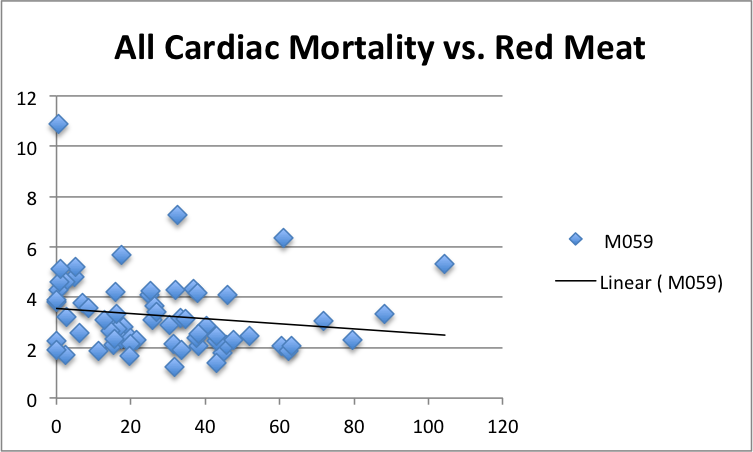 Does eating red meat cause an increase or decrease in heart disease mortality? So we will simply plot the raw data, and look at the trend. There is no cherry picking here. This is all the counties, or at least all the counties that reported on it (almost all). We got the raw data for an Oxford site. Lets start with all cause mortality, as there is no ambiguity about the diagnosis. This is a clearly downward trend. More red meat, less death. Did they eat too much red meat? Not likely, as these counties are not very affluent. It was also likely pastured. What ever it was, it was good for them. Let’s try cancer, as the WHO insinuation is that red meat is carcinogenic. The trend is the same. 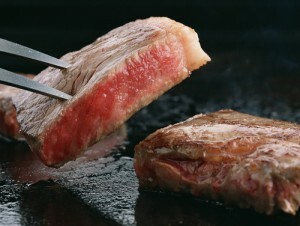 More red meat—less cancer. The specific category was “mortality ALL MALIGNANT NEOPLASMS AGE 35-69.” All counties reported on this. Same trend. Red meat is protective. What isn’t protective? 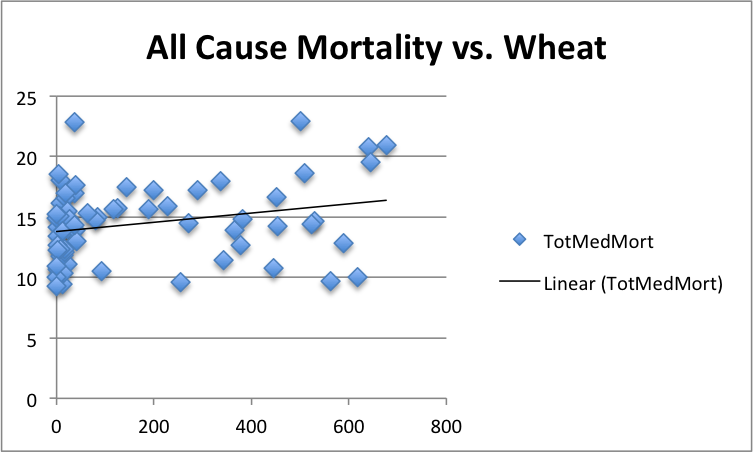 Lets look at wheat and all cause mortality. More wheat—less life. The more wheat you eat, the less healthy you will be. The constituents of fat and protein are the same regardless of source. The health conclusion: The healthiest choice is 1) eat clean, well raised red meat -and- don’t eat to much of it. Vary your meats. Vary your vegetables. The political conclusion: Proponents of sustainability and animal rights consider their cause to be noble. It is our opinion that they regularly manipulate data to raise public support for these causes. We do not propose to argue the wheres and whyfors of the cause. Our message is simple. Red meat is part of a healthy diet. So is fish and fowl and colored vegetables. If we give up red meat, we will be less healthy. We will die younger. If the healthfulness of red meat isn’t the message the advocates of the noble cause want to hear, its too bad, but massaging the data to produce “desired” results strikes us as a very disingenuous way to support a cause.